(updated June, 2010) This article was published in the July, 2002 CORSA Communique. 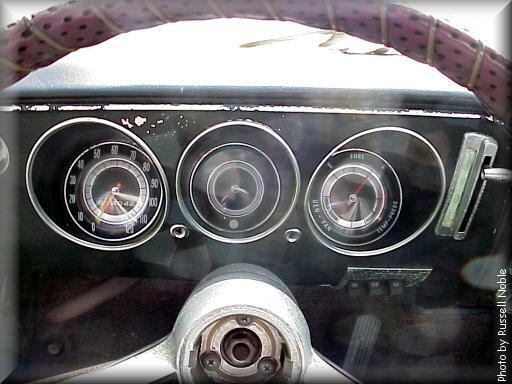 Russ Thuleen told me about the existence of a Stateside 1966 Belgian Corvair in the spring of 2002. After learning how rare Eric Boughner's Antwerp-assembled 1966 Corsa coupe was, I was very surprised to hear of another 1966 Belgian Corvair that survived, especially in the U.S. In case you haven't read the article on Eric's car, Antwerp, Belgium was the location of GM Continental or "CA" (Continental Antwerp), General Motor's wholly-owned importer, distributor, and assembler. Russ' friend Russell Noble, of Birmingham, AL, was kind enough to visit the car three times to check out facts and to take the pictures shown below. This Monza coupe has a GM Continental body tag and a Willow Run Fisher Body tag, along with a Willow Run VIN tag! Clearly this car was different from Eric's car, which has body and VIN tags from GM Continental only. 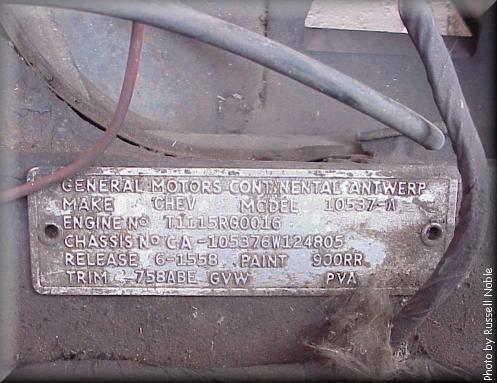 The GM Continental tag is mounted on the left side of the rear frame rail of the engine compartment while the Fisher Body tag occupies the familiar right side of the rear frame rail. The VIN tag is attached to the left frame rail, as usual. Everything else we can see from the pictures confirms that this was a Willow Run car. The "T1115" on the engine block means that the engine was built in Tonawanda, NY on November 15. 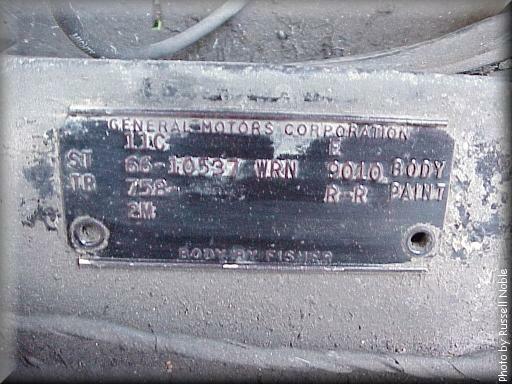 The "RG" indicates '65 - '67 95 HP with PowerGlide transmission and the "2M" on the Fisher Body tag confirms the PowerGlide equipment. 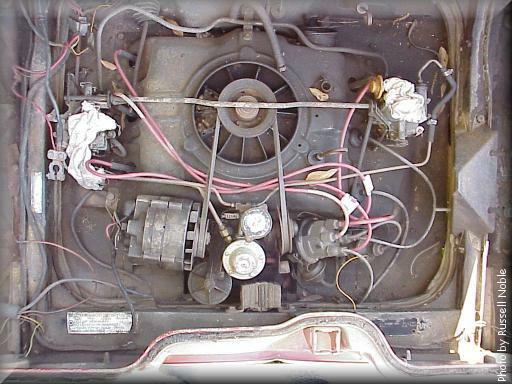 The 95 HP engine was standard in all Monzas and 500s from 1964 through 1969 although most dealers ordered a 110 HP engine for Monzas. 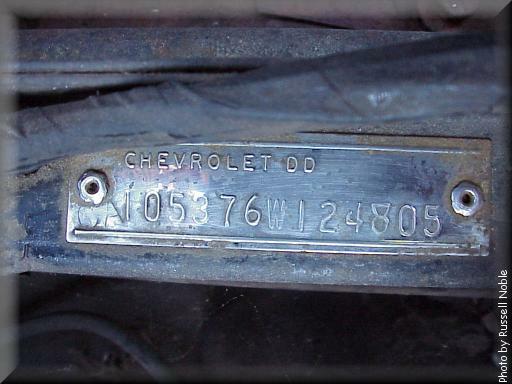 The "0016" engine code suffix, found on both the block and on the body tag, was no doubt added by GM Continental so that the engine could be traced to this particular car. We've seen this done on other European Corvairs, both CKD & SUP. 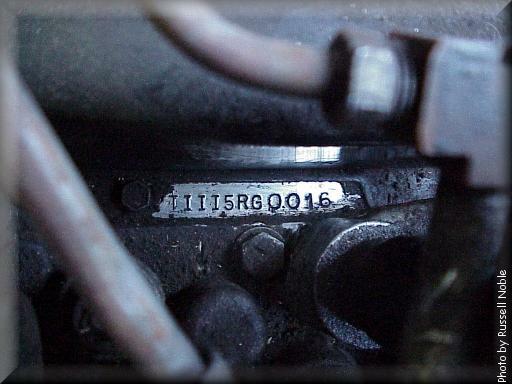 The regular Tonawanda-stamped engine code indicated only the date built and the engine type; it didn't connect an engine to a specific car until the 1968 model year, when Willow Run started stamping the car's VIN after the Tonawanda code. Finally, Russell found no evidence that the car ever had a foot operated headlamp flasher, like Eric's car had. Some of the 49 SUP Corvairs sold in Belgium during calendar year 1966 were very likely manufactured in Canada, since we know from the 1966 Corvair Manufacturing Schedule that Canada produced SUPs for Belgium and Switzerland during that time. As to why some (like this car) were also manufactured in the U.S., Dave suspected that it was ordered by a U.S. serviceman stationed in Europe—most likely Germany, which was GM Continental territory—and therefore would have been U.S.-built but passed through the GM Continental factory and dealer network to get to the serviceman. Dave noted that since the cars would eventually be shipped back to the U.S. when their owners' tours were over, it may have been important that they be built to U.S. spec, at Willow Run, for continued warranty service, body repairs requiring paint matching, etc. Bob Hall, who spent five years in Germany in the late '60s and early 70s, first in the Army and, later, as a civilian, said he made the same assumptions as Dave when he first got to Germany. Fortuitously, Bob gained direct experience with the end-to-end purchase and delivery process for U.S. military personnel. He began by assisting some of the soldiers in his command as they purchased new cars and he bought a new Corvair for himself while stationed there. Later, Bob went to work for GEICO in their Heidelberg office, where he approved loans for bases across Germany as assistant manager and, later, manager. Based on Bob's experience dealing directly with new car sales for U.S. servicemen, our Belgian "Army Brat" is correctly named, but was purchased new by a European who later sold it. It must have been "saved" later by a serviceperson or DOD civilian who purchased it used "on the economy", which was very common, and brought back to the U.S. Russell commented, "The current owner, Carl Smith, has no clue of the car's background. The car is in poor shape, although it is all there. Rats have infested this car! Carl is an elderly gent looking to divest his collection." If you are interested in buying the car, contact Russell. 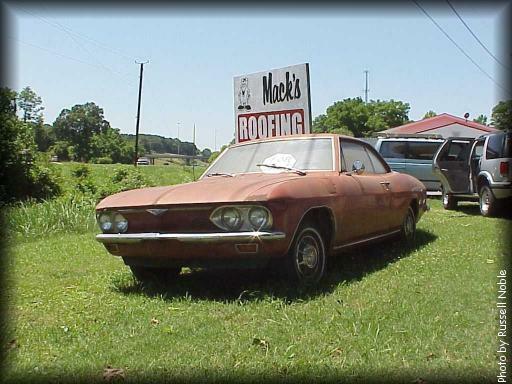 Many thanks to Bob, Dave, Russell, and Russ for helping bring the story of this rare Corvair to light!